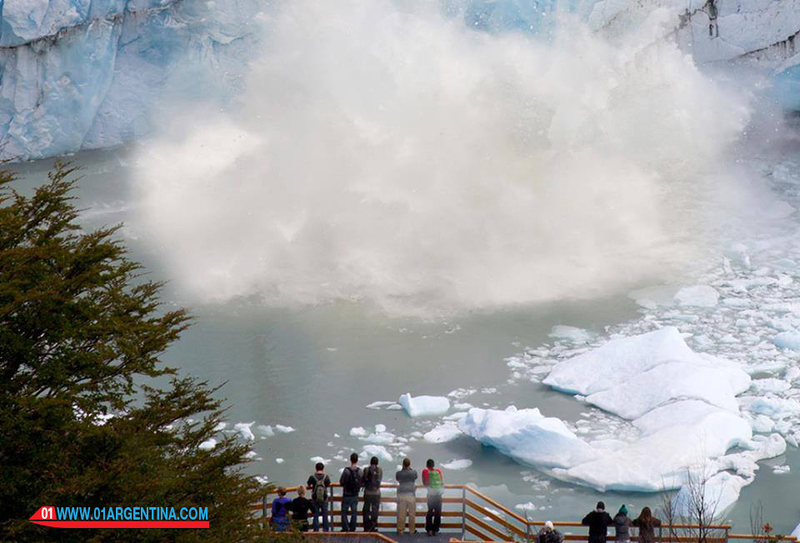 3000 tourists per day await the breakdown of Perito Moreno Glacier. The ice structure is supported on the coast and prevents normal drainage; more than eight meters of water contained, which presses on the natural wall; 3000 tourists per day await the scenary. El CALAFATE.- An obelisk ice crumbles and falls silent resounding on the Iceberg Channel. Minutes after the impact noise comes from water to gateways located 500 meters straight and mixed with the screams of 3000 tourists, the usual audience every day in peak season. “The glacier is closed,” repeated like a mantra standing in front of the Gothic beauty of the seracs. The Perito Moreno, the most famous glacier in Los Glaciares National Park, leaned over his frozen body on land and formed the natural dam. According to the register kept by National Parks, water is not filtered through the ice wall and 8.60 meters of vertical drop and water is recorded from the lakes natural wall separates. The measurement is made with a scale placed by EVARSA -company SA engineering services specializing in water resources and environment at the Rio Mitre branch, right at the entrance to the park, about 35 km from the glacier. The increase is gradual and steady. The phenomenon is repeated with varying frequency since 1917 according to historical records, it happened again this summer. Last October, the authorities of Los Glaciares National Park officially confirmed the closure, but here no risk, even those who know more, when you can break the precipitous. The water of Brazo Rico and South Arm increases until the principle of buoyancy thrust force exerted on the dike equals its weight. When the ice off somewhere along the rocky support begins filtering water and breaking process, which is irreversible starts. It is not due to mechanical fracture of ice, but the development of a subglacial channel. “It is often confused close to rupture. Close is the beginning of the ice dam that prevents the normal passage of water and break it is back breaking as a result of this closure,” he explained the director of Glaciarium, which is mountain guide and lover Patagonia. Maybe because the ice comes alive whenever it decides to embrace lovingly to land, a bond that inevitably break.